Marketing Agencies Ireland News: John Lewis A Flop? Marketing agencies Ireland news: John Lewis have finally dropped their 2016 Christmas advert. And people are decidedly on the fence. Some lament it’s lack of, well, ‘sadness’… This purposeful move towards ‘cheery’ could indeed signal the decline of ‘sadvertising’, a manipulation of the lowest threshold-emotion. ‘Sadvertising’ is an exercise which John Lewis actually perfected and pioneered; and not least in their last year’s offering, the ‘Man on the Moon.’ So while it’s proven to have worked, 2015’s had some people overdosing on melancholy. This years ad starts with the boxer dog, ‘Buster’ watching his owner bounce on her bed. We cut then to her father assembling a trampoline outside as a Christmas gift. “Oh wait, theres not much happening, throw in more animals!” I can literally hear Mr. Lewis shrieking. So, out comes foxes, badgers, hedgehogs and they all have a grand ol’ time on the newly assembled trampoline. Much to the chagrin of Buster of course. Come Christmas morning, he is out the door like a hot snot and is bouncing away on the trampoline himself. The parents and child are in shock; you would be too. Thats it, thats the whole advert. Honestly. The ‘Bounce bounce’ Christmas offering is way more light-hearted than what we’ve seen. It’s also knowingly comedic. No wistful, tender laughs here. Rather, brash, purposeful editing, and a humorous tone is employed. From the parent’s and child’s reactions, to the idea of the jealous boxer bouncing on the trampoline, its all soft slapstick. 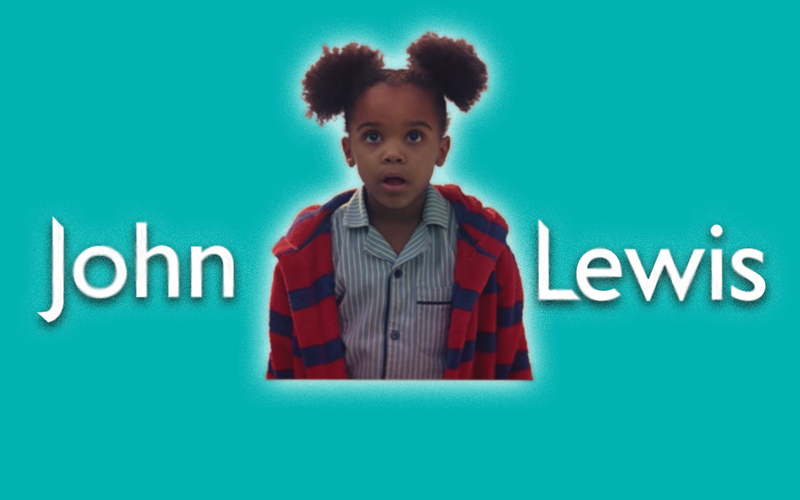 It’s wholly different, and it works to a degree, but considering what is at stake now that John Lewis has placed themselves on top of the Chrimbo ad-pile, its a ponderous choice. It just doesn’t make enough of a statement. When you consider the amount of money, time and effort I presume was spent on it, it just feels flat. From an emotional point of view (sad, funny, otherwise), its ‘meh.’ I couldn’t possibly speak for any of the other marketing agencies Ireland holds. But this particular one thinks its a missed opportunity. I mean, its fine and you snigger quietly and all, and you admire how good the animals look. But its just not John Lewis. To me, it was a panic decision after their perceived failure of last years ‘Man on the Moon.’ They’ve gone and muddied their brand projection to consumers. People need now look elsewhere for their ‘feels’. Is there no one else?! We could have smiled and lied and said “Oh, classic John Lewis, top job guys,” but no… That is not the preserve of the kind of marketing agencies Ireland could trust. Merry Christmas, you filthy animals!